The 2018 Yankees had an adequate rotation by any metric. If Wins Above Replacement is your go-to, they were 10th in Baseball Reference WAR and fifth in Fangraphs WAR. They had the 14th-lowest ERA, eighth-highest strikeout rate and eighth-lowest walk rate. Their 110 home runs allowed was middle of the pack and their 65 wins were fourth-best in baseball, much of that owing to one of the best bullpens in history. Ultimately, that fine -- not great, certainly not bad, but fine -- rotation was the Yankees' undoing in the postseason as the Red Sox's supercharged lineup got to J.A. Happ, Luis Severino and CC Sabathia. Perhaps if you play that same series again, the rotation bests Boston, but you only get one chance in a short series. Them's the breaks. With Happ and Sabathia hitting free agency and Sonny Gray soon to be dealt, the Yankees had three holes to fill in their rotation this offseason. They quickly plugged those holes by re-signing the former pair and trading top prospect Justus Sheffield to Seattle for James Paxton, who had a career season that featured a no-hitter. Paxton, at his best, could be the ace that the team needs alongside Severino, taking weight off the young righty's shoulders and setting the stage for a playoff juggernaut. Therefore, on paper, New York enters 2019 with a much-improved rotation, one perhaps suited to right 2018's wrongs. 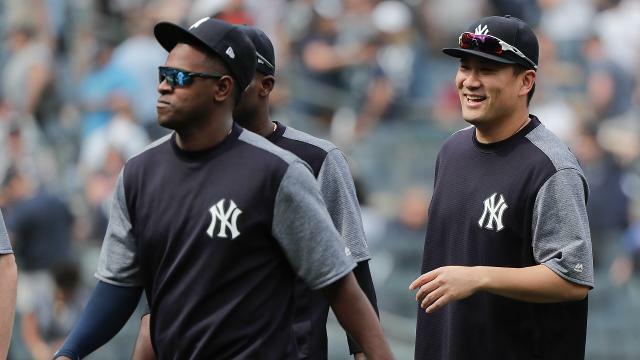 Between Happ, Sabathia, Severino and Masahiro Tanaka, the Yankees' current rotation features pitchers who made 100 of the team's 162 starts. Happ, a midseason acquisition, can be penciled in for 15-23 more starts while Paxton's history suggests he'll start 25-27 times in 2019. Predicting health is a fool's errand, but the Yankees have their fair share of injury risk in that rotation. Sabathia enters his final season coming off heart surgery and his annual knee cleanup. Tanaka has spent time on the DL in each of his MLB seasons except 2016. Paxton has been a walking soft tissue injury and while none of his issues have recurred or featured his elbow/shoulder, he's yet to make 30 starts in an MLB season. Therefore, even though the Yankees have a five-man rotation that stands up well to last year's crew, they may not have the same crew in a few months. Jordan Montgomery made six starts before Tommy John surgery last year. Domingo German, Jonathan Loaisiga and Luis Cessa helped fill in with middling results, and they're the current six-through-eighth starters. Right now, the Yankees would certainly sign up for 135+ starts out of their top five, provided they can have them healthy for October. That's where Aaron Boone's job comes in. While pitcher injuries can't be prevented in full by a manager's performance, Boone can help lessen the burden on his top starters by utilizing his bullpen. Somehow, the Bombers have a bullpen even more formidable than last season, and they'd be wise to use it. Boone, of course, can't overwork his top relievers, but the Yankees have at least six above-average pitchers in the bullpen, giving them room to shorten games with a variety of hurlers. When the Yankees turn to their next tier of starters, they could turn to a rival's tactics for optimization. Jonathan Holder served as New York's "opener" in one game last September with positive results and the Yankees could try to recreate that this season. Whether it's Holder, Green or another reliever starting the game, they could hand a clean game, and perhaps lead, in the second inning to German, Loaisiga or whomever, allowing them to skip the top of the order the first time through. The opener strategy necessitates a roster with at least 13 pitchers, which the Yankees employed for most of last season, and a cast of long relievers rotating into the final spot in the bullpen, provided the team tries it before rosters expand. Would New York model its 25-man roster in this way for an extended period? That might be tough to stomach, even if injuries befall the staff. Regardless of how they deploy their depth, the Yankees know the road ahead of them. As with every team heading into the spring, they face questions in the rotation. Will the ace actually be an ace? Will the veterans continue to age gracefully? The Yankees have the fortune of knowing their five pitchers going into Spring Training without needing a competition or outside signing. Now, they simply need to ride out the spring and see how far their top five can take them.